Two-sentence summary: Sixty-two years after Janet Jones publishes her first novel, high school student Abby Zimet bases her senior project on lesbian pulp fiction. Told using dual-narratives, this gay coming of age story ties two queer teens across generations. 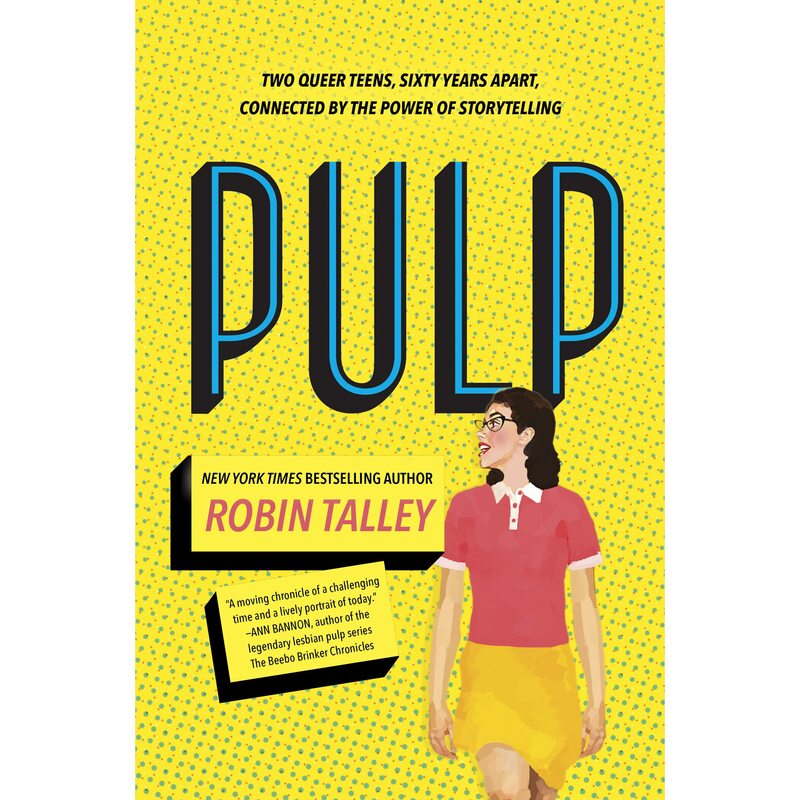 Portrayal of LGBTQ issues: Pulp is a one-half contemporary, one-half historical gay YA book that follows two cis lesbian teens in the 1950s and 2010s. It explores sexuality through the lens of pulp lesbian fiction, which was one of the first venues that queer women openly expressed themselves in the United States. As obscenity laws relaxed in the late ’50s, pulp writers were allowed for the first time to write uplifting and hopeful books about queer women. It’s an underground subculture that doesn’t often receive attention in LGBT books for teens but nevertheless foreshadowed the gay rights movement about a decade later. Pulp also features a non-binary character and briefly discusses gender identity and “they/them” pronouns. What I Loved: Robin Talley is one of my favorite LGBT YA writers, so I’d had high hopes for this one from the beginning. That being said, Pulp stands on its own even apart from Talley’s other novels. It immerses itself equally in the lesbian community during the 1950s and 2010s through the two vibrant protagonists. The two emotions that define this book are love and hope. Even through heartbreak, discrimination, internalized homophobia, and other challenges, Janet and Abby retain sight in a better, kinder tomorrow. They love fiercely and sometimes desperately while creating work that reflects their experiences, which I think is a meaningful message for queer teens in similarly tough situations. The narrative switches between Janet and Abby was also really well done, especially as their stories intertwine later in the novel. Their experiences as queer teens are so similar in their hearts and desires, yet the way their generation reacts to who they are is incredibly different. It reminded me how fortunate we in the LGBTQ community to live in a more understanding culture while also feeling gratitude for those first people who openly expressed their sexual orientations. Pulp comments on how far we have come while spreading this message of hope to future strides in the queer acceptance movement. Recommended: This is the second good LGBT historical YA novel by Robin Talley that I’ve read, the first being the civil rights-era romance Lies We Tell Ourselves. I’d recommend this one for anyone interested in queer American history as well as those interested in reading how far the gay rights movement has come since the ’50s.